(by Tom Anderson, CNBC) – On average, more than 3,000 borrowers default on their federal student loans every day. “Despite a booming stock market and unemployment falling, student loan borrowers are struggling,” said Rohit Chopra, a senior fellow at the Consumer Federation of America and a former student loan ombudsman at the Consumer Financial Protection Bureau. You can avoid defaulting by borrowing an appropriate amount for you or your children’s college education. Mark Kantrowitz, vice president of strategy for college and scholarship search site Cappex .com recommends that students generally take out no more debt than their expected first year’s salary out of college. People with private student loans face limited options. Some private lenders offer forbearance if borrowers can’t make their payments. Those benefits aren’t as robust as those with federal loans and typically last no more than 12 months. And unlike most other debt, you usually can’t get rid of student loans through bankruptcy. First published at CNBC on March 8, 2017. Reprinted here for educational purposes only. May not be reproduced on other websites without permission from CNBC. For the original article, visit CNBC .com. 1. Define default as used in the article. 2. How many Americans currently hold federal student loans? 3. What percent/number of Americans with student loans are in default? 4. 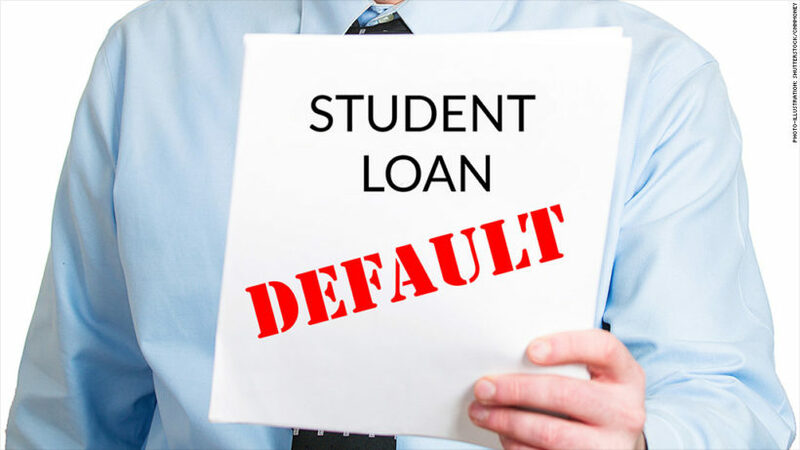 List the consequences of defaulting on a student loan. 5. What is a good way to avoid defaulting on your student loan, according to Mark Kantrowitz? 6. How do lawmakers propose helping students who are having trouble paying back their student loans? 7. Many people make the incorrect assumption that they do not have to repay their student loans if they declare bankruptcy. Unlike most other debt, you cannot get rid of your student loan debt by declaring bankruptcy. What is the maximum student loan you think you can afford to repay based on your career choice? List several ways a student could avoid graduating college with a huge student loan debt. CHALLENGE: It is important to make a plan before you start college. The Income-Driven Repayment Plans will help you out should you find yourself in trouble, but not getting into a huge amount of debt is the best plan. Starting out life with a 20 year debt is not the way to go. Ask a few adults you know if they are in a student loan debt and how they view taking out a student loan that is difficult to repay.